The longest goal -- There is no official statistic for longest goal in NHL history scored with a goaltender in net, but it's hard to imagine one being much longer than the one New York Islanders defenseman Rob Davison scored against Toronto's Vesa Toskala. With the Islanders killing a first-period penalty, Davison got control of the puck to the left of his own goal, nudged it a couple of feet in front of the goal line and slapped it toward the other end of the ice. The puck bounced its way down the ice -- until it made a right turn about eight feet in front of Toskala and took a last bounce into the net. The only good thing for Toskala and the Leafs was the embarrassing goal became nothing more than a footnote when Toronto got three goals in the third period for a 3-1 victory. Good start -- There hasn't been much to cheer about on Long Island recently, so the NHL debut of 2006 first-round draft pick Kyle Okposo has been a much-awaited event. He didn't have a point in the New York Islanders' 3-1 loss to Toronto on Tuesday, but did enough to show he can be an impact player. Okposo had two shots in 14:45 of ice time. "I thought he played really well and he handled himself well," said Islanders captain Bill Guerin, whose locker -- not coincidentally -- is next to the rookie's. "He's a young kid and he's got a long way to go, but he's going to be a good player. You can tell he's got good skill. It takes time. There's very few guys who just jump in and become stars." It took Okposo a period or so to settle down and realize he was playing against NHL players, not a rink full of skating Supermen. Okposo brings the Islanders some desperately needed offensive skill -- the Isles are last in the NHL with 177 goals and are icing a lineup full of minor-league call-ups. Save of the season -- Looking for a candidate for save of the year? Check out Antero Niittymaki's stop on Ilya Kovalchuk in the final seconds of Philadelphia's 3-2 victory against Atlanta. The Flyers appeared to be cruising to a 3-1 win and the end of a four-game losing streak when Kovalchuk scored with 30 seconds remaining. The Thrashers got the puck in the Flyers' zone in the final seconds, and Kovalchuk wound up all alone in the slot, 10 feet in front of Niittymaki. He let the puck go in an instant, only to be robbed by right leg of the Flyers goaltender. ''Most of the time I score those kind of goals,'' said Kovalchuk, who fell to the ice as the Flyers celebrated around him. Niittymaki said it was just another save, and that he "just reacted." But it would have been interesting to see how his team would have "reacted" if Kovalchuk's shot had gone in and the Flyers had lost a game they appeared to have locked up. "It's just an unbelievable save," Flyers coach John Stevens said. "It's unfortunate he had to make that save at that point. We have not done things easy lately, and we needed a play like that to get back on track." If the Flyers make the playoffs by a point, Niittymaki's save may turn out to be the reason. Still trying -- The Columbus Blue Jackets know making the playoffs won't be easy. A few more efforts like Tuesday's 3-0 victory over Calgary at Nationwide Arena, though, would help. The Jackets did almost everything right. New captain Rick Nash scored one goal and set up two by Manny Malholtra. The defense shut down Jarome Iginla and limited Calgary to 18 shots -- and backup goalie Fredrik Norrena stopped them all. Norrena's play was a big help. He was in goal for the second consecutive game after starter Pascal Leclaire took a shot in the head during Sunday's warmups. ''He was really sound,'' Hitchcock said. ''The thing that was impressive for me was the no rebounds." This win was a lot easier than Sunday's 4-3 victory against Detroit, in which Norrena made 43 saves and stole two points. Two was enough -- After back-to-back losses during a visit to Florida, the New York Rangers didn't want to go to New Jersey tonight riding a three-game losing streak. They didn't, thanks largely to Sean Avery and Henrik Lundqvist. Avery scored twice and Lundqvist made 22 saves in a 5-2 victory over Pittsburgh at Madison Square Garden. The Rangers are 5-0 against the Devils this season, but going into Prudential Center with a win under their belts should make things a lot easier. At last -- The St. Louis Blues got their first win in seven games in a very unlikely place. The Blues were 11-41-7 all-time in Montreal and were facing one of the NHL's best and hottest teams. But they got their first road win in more than a month when Brad Boyes' shootout goal gave them a 4-3 victory over the Northeast Division leaders. The Blues had lost 10 in a row on the road and were 0-5-1 on their current nine-game trip, which continues Thursday in Ottawa. It's fair to say they weren't exactly brimming with confidence entering the Bell Centre. Alex Ovechkin banked in an empty net goal last night against the Predators to earn the Caps a big two points in their quest for a playoff berth. Playing the angles -- It doesn't show on his resume, but Alex Ovechkin must be a heck of a pool player -- how else to explain his perfect bank shot into an empty net to close Washington's 4-2 victory in Nashville? Ovechkin picked up the puck in the middle of his own zone, looked up and made a bank shot that Willie Mosconi would have been proud of -- the puck went slowly but surely right into the middle of the net, an instant before Nashville defenseman Marek Zidlicky arrived. ''I was just trying to get the puck into the neutral zone, so it was the luckiest score ever,'' Ovechkin said of goal No. 58. The goal and two earlier assists gave him a League-high 102 points, making him the first Washington player to break the 100-point mark twice in a career. But he was much more interested in the two points that moved the Caps into ninth place and kept them two points behind Philadelphia for the final playoff berth in the Eastern Conference. 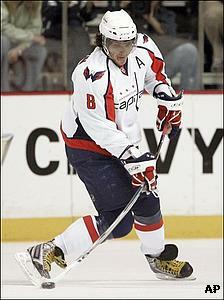 "The most important thing for me is not beating some records," Ovechkin said. "Right now it is all about winning games and all about getting two points." No quit in these guys -- Don't tell the Edmonton Oilers they have no chance to make the playoffs. The Oilers are five points out of the final Western Conference playoff berth after an 8-4 victory over the Phoenix Coyotes at Rexall Place. But with 10 wins in their last 12 games, there's universal belief in the locker room the deficit is not insurmountable -- especially not compared to where they were a month ago. Making up the five-point gap won't be easy, but the Oilers believe they can do it. Have sticks, will travel -- The San Jose Sharks may not have enough time left to catch the Detroit Red Wings for first place in the Western Conference -- they trail by five points after a 2-1 victory over the Kings in Los Angeles -- but it's not for lack of confidence. After going 12-0-1 in their last 13 games, center Joe Thornton feels his team is ready for anything. "We feel confident going anywhere, playing anyone," Thornton said after the Sharks' NHL-best 26th road victory. "When you have your confidence, that's the biggest part of the game. We have to continue it now." The Sharks' first goal is a division title -- they're five points ahead of Anaheim and six in front of Dallas with nine games left. "We're as focused as we can be on first place in the Pacific Division," Thornton said.